A rendering of shops and restaurants at One Paseo. 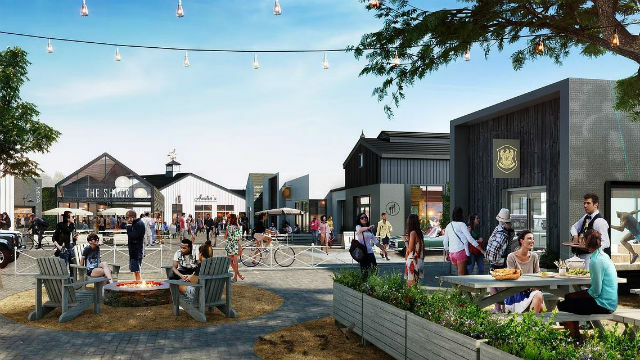 The developer of One Paseo in Carmel Valley has announced three more restaurants that will be located in the mixed-use development when it opens in early 2019. The new restaurants are Joe & The Juice, a juice bar and sandwich cafe founded in Copenhagen; The Butchery, a full-service butcher shop; and North Italia, a modern Italian neighborhood restaurant. The three join a culinary lineup that includes International Smoke, Tocaya Organica, Sweetfin Poké, Ways & Means Oyster House, Shake Shack, Parakeet Café, and Tender Greens. “Our original goal was to create a dynamic mix of dining options from fast-casual to sit-down restaurants that will give the community a selection of great choices for breakfast, lunch, and dinner. We could not be happier with the restaurant tenants who have joined the One Paseo community—some are local favorites, and several are internationally recognized eateries,” said Nelson Ackerly, senior vice president of Kilroy Realty. “In the next few months, we look forward to announcing an exciting mix of retail tenants and programming that compliments this mix of restaurants,” he added. Located at the southwest corner of Del Mar Heights Road and El Camino Real, the complex will include 95,871 square feet of retail an restaurant space, 280,000 square feet of offices, and 608 multi-family residential units in a 23-acre lot.